As a “World Kindness” act, Ashton Azadian, Thurston Middle School 8th grade Student President, and Cole Curtis, Thurston Middle School 8th grade student, came up with “Warm for the Winter Coat Drive” to collect donations of jackets, coats, and sweaters for the homeless in the community. They asked City Council for their approval on Tuesday to place their collection boxes in various city locations for people to donate items. Mayor Bob Whalen asked City Manager John Pietig how the collection boxes could be placed in certain city buildings. City Manager Pietig said the city’s typical policy was that the city did not allow solicitations. He said that on an occasional basis it would be possible, if the City Council would like to make an exception for the local students to place their collection boxes or flyers in certain city facilities. Councilmember Toni Iseman said there might be room at the Woman’s Club or on the sidewalk at Gelson’s Market for the Thurston students to place their collection boxes. This week, the LBHS Golf team had its first two golf matches within the Sunset Conference, which consists of two leagues – the Surf League and the Wave League. Laguna is in the Wave League and both teams we played are in the Surf League, so these are considered “cross league” matches. On Tuesday, March 19, we took on took Newport Harbor HS on the Mesa Linda course at Costa Mesa Country Club, par 35. Newport won the match 192-228. Our guys had some trouble putting on the sloping greens. Putting on Mesa Linda is always a challenge because you never really have a flat or straight put. However, we really should have scored better; it was just one of those matches when everyone seemed to have an off day. Individual scores included: Gus Morck - 42, Chase Gioffredi - 43, Jameson Roller - 45, Aiden Svenson - 45, Kyle Shaw - 53, and Tai Diggins - 53. On Wednesday, March 20, we played Corona del Mar HS on the front 9 holes at Aliso Viejo Country Club, par 35. Although we shot our best team score of the year at 211, Corona del Mar won the match 175-211. Guy Clauss from CdM earned match medalist honors, shooting a -2 score of 33. Low scores for Laguna came from Gus Morck and Chase Gioffredi, who both shot 40. Our overall record is now 4-3. We are 0-2 in Sunset Conference cross league games. It was nice to see our guys continuing to show improvement; but we just didn’t have the firepower to compete with CdM. As a team, CdM shot even par, so it looks like they are becoming one of the top teams in the county. Laguna player scores included: Gus Morck - 40, Chase Gioffredi - 40, Aiden Svenson - 43, Tai Diggins - 43, Jameson Roller - 45, Cade St.Clair - 50, and Andrew Mundy - 56. We had another big win on Sunday at the final Scholastic Surf Series Event of the season at the Southside of Huntington Beach pier. We started out the day with team competition, up against St. Margaret’s. Everyone surfed really well as a team, and we took the overall win 53-31. Individual Champions were Kiko Nelsen and Cameron Taylor. It was a total team effort with several of our surfers jumping in to surf multiple divisions. Our two women surfed in Shortboard and Longboard with great success. During the team portion, Kayla Coscino scored a perfect 10 out of 10 in Shortboard on a long right that she ripped from start to finish. She also did really well with big scores in Longboard as well but wasn’t able to stay around for the Individual competition. Freshman Cameron Taylor took over representing the women of Laguna and put in a super effort. She won the Shortboard and took 4th in the Longboard. In the Men’s Shortboard and Longboard, Kiko Nelsen and Christian Schenk both did double duty, scoring lots of team points with Kiko competing very successfully, going on to the finals in both divisions in the Individuals. Kiko ended up stealing the show in Shortboard with the overall win and took a 3rd in the Longboard. Others surfers who did very well throughout the day were Tyson Lockhart taking a 3rd and Liam McCue taking a 4th, both in the Shortboard Final. Dylan Zoller did nicely in the Bodyboard and took 3rd overall. Meanwhile Gavin Campbell also performed well as did Holden Geary and Cooper Laws, who all helped with the team score points to win. The weather was finally hot and sunny with really fun surf that stayed glassy all day. It was a great way to finish off the Scholastic Surf Series. Nine teams representing Laguna Beach High School, Thurston Middle School, and Top of the World Elementary from Laguna Beach Unified School District qualified to move on to the Destination Imagination (DI) state competition on April 6 in Clovis. Three teams competed in the Improvisational Challenge (Heads Up). The challenge asked them to research historical figures found on coins from around the world, create and present an improvisational skit that includes the historical figures in a tale, integrate an event that has an impact on the tale, present the skit in two parts changing between comedy and tragedy, and present the skit in two styles, changing from verbal to nonverbal. Last Thursday, March 7, the LBHS Boys Golf team won a non-league match against Ocean View HS at Mile Square Golf Club. Senior Jameson Roller and junior Tai Diggins earned co-medalist honors with scores of 43. The win brought the team’s overall record to 3-0 on the season. This week, the team played home and away matches against old league rival from the Orange Coast league, Estancia HS. The teams ended up splitting the matches, with each team winning on their home course. On Tuesday, March 12, the Breakers played at Mesa Verde Country Club in Costa Mesa, par 36. It is a very nice William Bell designed course with tough green complexes. Estancia won this match by the score of 242-226. LBHS only had two players who had seen this course before, and all the player’s scores were higher than normal on the tough course. Chase Gioffredi earned medalist honors for the match with a score of 42. Other player scores for this match were: Aiden Svenson - 46, Andrew Mundy - 51, Trent Ralston - 51, and Tai Diggins - 52. On Wednesday, March 13, the team played on Laguna’s home course at Aliso Viejo Country Club, par 35. The Breakers bounced back nicely, earning a win by the score of 215-224, bringing the team’s overall record for the season to 4-1. Senior co-captain Chase Gioffredi continued with his solid ball striking getting two birdies on the round to earn medalist honors with a two over par score of 37. Senior co-captain Gus Morck also played great with one birdie, shooting 40 in only his second round back after recovering from an injury. What really contributed to winning the match, however, were two good scores from the middle of the lineup – senior Jameson Roller with a 43 and junior Tai Diggins with a 45. Senior Kyle Shaw and junior Aiden Svenson both finished with scores of 50. “This was our best team performance of the year and a big win for us before moving into the tough Sunset Conference matches beginning next week,” said Coach Sean Quigley. 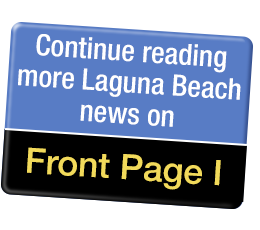 A majority of the Laguna Beach Board of Education dumped bylaws at a testy meeting Tuesday night, including those that pertained to the annual election of officers and rotation of the presidency. Recently re-elected board member Dee Perry was the lone opponent of the 4-1 vote that she believes was aimed at her for questioning why she had been blocked from assuming the presidency after serving two years as clerk, a longstanding board tradition, if not a mandate. Veteran board member Jan Vickers is serving her third consecutive term as president, a violation of the now defunct bylaws, according to Perry. Perry was twice bypassed for the presidency. Normandin accused Perry of convincing the community that there is a conspiracy against her when in fact she is not equipped to be president, according to Normandin. At this point, board member James Kelly called for a vote. However, Perry requested time to respond to Normandin’s comments. She said she did not think she had to be nominated because the clerk always became president, which board member Peggy Wolff claimed was not always true. Perry also said she had offered to serve as Co-President (a non-existent office) with Normandin, who was elected clerk at the December organizational meeting. Prior to the vote, board watchdog Howard Hills called for a new election of the president, in one of his several appearances at the speaker’s podium. Normandin’s husband, Ken Parker, said for the record that Hills should stop wasting the board’s time so his wife could get home a half-hour earlier after meetings. Laguna Beach Republicans President Emil Monda posited that the board preferred expelling Perry, an option not available because she is a duly elected official. “So you did the next best thing which is to marginalize her and ignore your own rules,” said Monda. Monda and Hills were the only members from the public that spoke in support of Perry. However, Perry informed the board that she had heard from about 100 people that they are afraid to speak up for fear of retaliation on students. The District’s attorney said only certain anonymous complaints can be added to the public record and remain anonymous. Perry said she was approached by many folks who assumed she had been elected president at the December organizational meeting and had to explain to them that the board was not following the bylaws and rotating the terms of the clerk and president so that each member would have a chance. “The upset is not about me being president; it is about the board not following the bylaws,” said Perry. At the March 12 School Board Meeting, the LBUSD Board of Education recognized the athletic excellence of the Laguna Beach High School Girls Water Polo team. The team finished the CIF Southern Section season with a 29-1 record, beating Corona del Mar for the CIF-SS Division 1 girls water polo championship. The musical is a reimagining of the Biblical story of Joseph, his father Jacob, 11 brothers, and the coat of many colors. The show will continue on March 16, 22, and 23 at 7 p.m. The musical follows preferred son Joseph who, after being sold into slavery by his brothers, ingratiates himself with Egyptian noble Potiphar, but ends up in jail after refusing the amorous advances of Potiphar’s wife. The company of “Joseph and the Amazing Technicolor Dreamcoat” includes more than 50 Laguna Beach High School student cast and crew members and 12 students from El Morro Elementary, Top of the World Elementary, and Thurston Middle School in the children’s choir. The musical is directed and choreographed by guest artist Paul Nygro. A veteran performer, Nygro has appeared on Broadway, Off-Broadway, and in productions across the globe. His credits as a producer, director, choreographer, and actor span a range of mediums, including theatre, film, and television. “Paul’s (Nygro) energy is infectious. He dives into projects with passion, commitment, and creativity,” said Laguna Beach High School and Thurston Middle School Drama Teacher and Director, Alexis Karol. “We are grateful that amidst his many professional commitments in Los Angeles he is willing to share his talent and skill with our Laguna Beach High School students,” she concluded. Tickets are on sale now at lbhs.booktix.com. Tickets are $12 for students, $17 for adults, and $22 for premium. The LBHS Boys Golf team is off to a strong start to open its 2019 season, winning its first two matches last week. The team captured it first win on Tuesday, Feb 26, by a score of 223-260, in a non-league match against Ocean View High School at Aliso Viejo Country Club (par 37 – the team played the back nine holes). The team followed up with another victory in a non-league home match on Thursday, Feb 28 against Costa Mesa High School at Ben Brown’s at The Ranch, that one by a score of 197-244. In Tuesday’s match, Laguna senior co-captain Chase Gioffredi had a good day shooting one over par at 38 and winning match medalist honors. The team was missing its number two and number three players that day, according to Coach Sean Quigley, and this was also the first time ever that the team played the back nine at AVCC. In addition to Gioffredi finishing at 38, juniors Aiden Svenson and Trent Ralston finished at 45, sophomore Andrew Munday finished at 47, and junior Tai Diggins finished at 48. During Thursday’s match, Gioffredi made two birdies and shot the lowest score of the day with a 2 over par 34. He earned the match medalist honors for the second consecutive match. In addition, Diggins had a good day scoring a 38.
were several big numbers on the player’s cards, which we will need to eliminate in order to improve in upcoming matches,” said Coach Quigley. The team has two matches this week, including tournament play on Monday (the results were not known by deadline) and another match against Ocean View, this time away, on Thursday.